It was hard to get a good photo of the Aavik/B?rresen/Ansuz system from Next Level HiFi of Wayne, IL, distributed by Gated HiFi, because the premiere Børresen 05 loudspeakers with D-TC Resonance Control ($120,000/pair) were spaced so far apart. But that spacing certainly didn’t stop the system from wowing listeners with its extremely strong bass, which on genuinely danceable party music was vibrating in my gut and propelling the 05s’ drivers back and forth. The exhibitors in the conference room underneath may have been cringing, but I ate up my opportunity to receive my first sonic massage of the day. Michael Børresen told me after the listening experience that the drivers have a new, iron-less magnet system that is claimed to virtually eliminate voice-coil induction and room resonance interactions. The drivers are all new, and utilize a carbon honeycomb sandwich membrane that is extremely light, strong, and stiff. This system, while in no way unduly bright, was naturally forthright on top when called for. I not only loved the trumpet sound on Miles Davis’s 1986 live performance of “Time After Time,” but I also got off on the convincing sense of air and space in which it held forth. 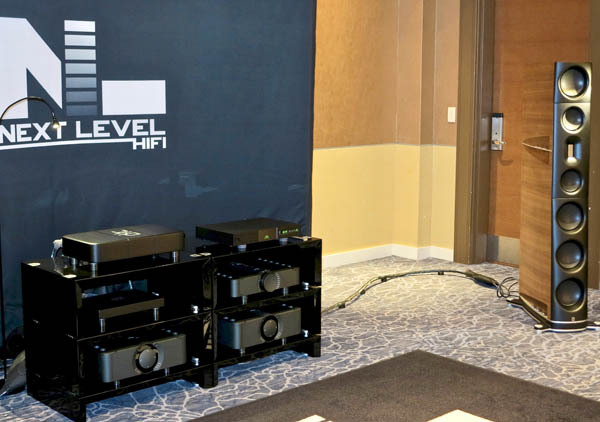 Deserving equal credit: Aavik M-300 monoblocks ($98,000/pair) and C-300 control amplifier (preamplifier) ($42,000), Naim CD5XS transport ($3995), D-TC Power Box ($3600) and Power Distribution ($23,000), And Ansuz D-TC Supreme cabling.